Enjoy Utah! : Thanksgiving Leftovers PARTY Idea! Every year after Thanksgiving, it's the same question on everybody's mind: what are we doing to do with all these leftovers?! This year, our family has decided to host a "Thanksgiving Leftovers Blind Taste Test Party"! It's usually the boys vs. the girls. During each round, one boy and one girl is blindfolded and headphoned, and fed a spoonful of food. They have to guess correctly what that specific food is. It's always fun to throw in things like Captain Crunch cereal, Basil leaves, Goldfish crackers, chicken (because they are automatically going to think it's turkey), and other random items in addition to Thanksgiving leftovers. The team at the end of the night with the most points wins. We will also be doing a kids round. We are going to ask each guest to bring a leftover dish to use for the Blind Taste Test. Upon arrival, each dish will be hidden on a table behind a vale, and assigned a number. When each person goes up to take their turn at the Blind Taste Test, they will pull a few numbers out of a hat. This will specify which dishes they will be Blind Taste Testing. 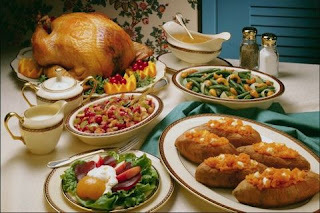 It's especially fun for families that have unordinary dishes as a regular Thanksgiving tradition. In my family, we always eat a Danish dish called "sweet and sour red cabbage". For us, it's normal, and we would recognize the taste anywhere; for other families, they would have no idea what it is. We are excited to try this party this year, and will update information, pictures, videos, and ideas after the party is over. We will be hosting it the Saturday after Thanksgiving (two days after Thanksgiving, since it's always on a Thursday).